The Castle That Never Was is a location found in Kingdom Hearts II, Kingdom Hearts 358/2 Days, and Kingdom Hearts 3D: Dream Drop Distance. This grand castle was the headquarters of Organization XIII and floats in place above The World That Never Was. The Dark City rests below. The upper portion of the castle releases a constant stream of red and blue smoke, which seems to create the clouds for the world below it. During the final battle with Xemnas, the Alter of Naught was broken off of the castle. 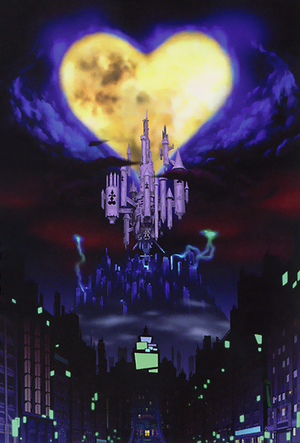 The Castle That Never Was then remained abandoned and empty with the Organization defeated, until the following year, when the new Organization gathered together for the resurrection of Master Xehanort. Playable characters in the area are Sora and Riku (Riku is only playable in the Kingdom Hearts world connected to the Castle and in Kingdom Hearts 3D: Dream Drop Distance). Of the several boss Nobodies in the game, the only ones you can fight in the Castle That Never Was are Xigbar, Luxord, Saïx, and Xemnas. Sora, Donald, Goofy, and King Mickey entering Nothing's Call. Nothing's Call (虚無への誘い, Kyomu e no Sasoi?) is one of the lowest known areas of the Castle That Never Was, acting as a sort of "basement". It appears to be the only entrance into the castle for people who are not members of the Organization. Sora, Donald, Goofy, and King Mickey enter the castle here. They are soon attacked by Nobodies, but make it to the next area. It is also here where Roxas fights Saïx when leaving the Organization in Kingdom Hearts 358/2 Days. The castle contains a number of dungeons, such as the Soundless Prison (無音の牢獄, Muon no Rōgoku?) that lies in its heart. Oddly, the bars of the cells are far enough apart that a prisoner could easily just walk out between them. Saïx uses the cells to imprison Kairi and Pluto, informing them that they are being used as bait to force Sora to slay more Heartless. After he leaves, however, Naminé enters through a Corridor of Darkness to help them escape. In the Kingdom Hearts II manga, Kairi escapes through the bars without help, but runs into Demyx as she and Pluto make their escape, and willingly returns to confinement out of pity when he begs her to keep him from being punished by Saïx. Crooked Ascension (歪みを貫く柱, Yugami no Tsuranuku Hashira?, lit. "Distortion-Penetrating Pillar") is an area of the Castle That Never Was that seems to be a giant elevator that ascends and descends without actually appearing to do anything. While inside, Sora, Donald, Goofy and Riku may be attacked by either Samurai or Dragoon Nobodies if going down to Nothing's Call or up to Twilight's View, respectively. Twilight's View (黄昏から望む場所, Tasogare kara Nozomu Basho?) is a stairway leading to the next floor of the castle. Sora can meet a Moogle here and synthesize new items. According to a flashback in Kingdom Hearts II Final Mix, occurring at some point before Kingdom Hearts 358/2 Days, Zexion and Xigbar discuss Xemnas's frequent visits to the Chamber of Repose and the discovery of Castle Oblivion here. Sora in the Hall of Empty Melodies, before encountering Xigbar. Hall of Empty Melodies (虚ろなる旋律の空間, Utsuro-naru Senritsu no Kūkan?) is a large, two-part room sometimes used as a combat training station for the Organization. It is composed of a large platform over an indefinite abyss, with a recessed second floor accessible via Naught's Skyway and multiple high balconies overlooking the room. The domed glass ceiling provides a view of the castle's highest tower. When Sora, Donald, and Goofy arrive, Saïx taunts them and sics a horde of Heartless upon them, but Riku and Kairi arrive in time to help fight the Heartless on the upper floor as Maleficent and Pete watch. Xigbar enters and challenges Sora himself, but is defeated just as Mickey and Ansem encounter the scene, and the two kings leave with full faith in Sora and his friends. Afterward, Sora's group sprints to the second floor via the skyway and are reunited with Riku and Kairi. Afterward, the room becomes a haunt for Sniper and Assassin. King Mickey rescuing Ansem the Wise from a group of Dusks in Naught's Skyway. Naught's Skyway (虚空を辿る道, Kokū o Tadoru Michi?) is a small outside path in a high section of the castle. It overlooks the eerie red-tinged clouds of Dark City. This is where Mickey finds DiZ, who is revealed to be Ansem the Wise, being attacked by Nobodies. 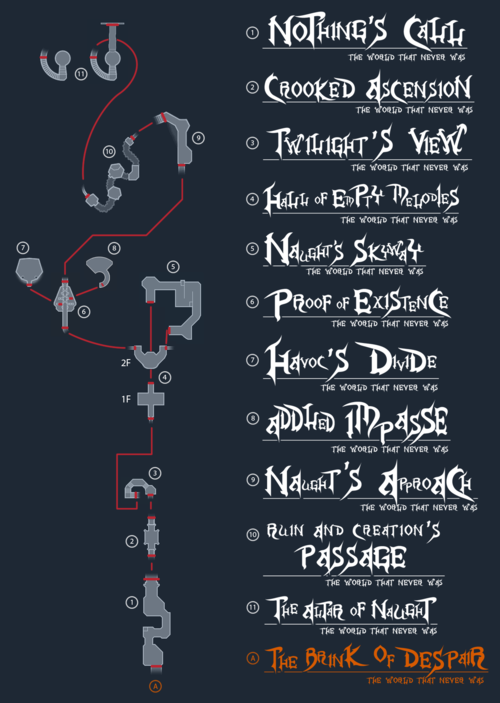 After they are defeated, the two walk off with Ansem's encoding machine. Sora and his companions pass through here in order to find King Mickey and Ansem the Wise. Sora and the others entering Proof of Existence after defeating Luxord. Proof of Existence (存在の証, Sonzai no Akashi?) is a multi-tiered mock graveyard for the members of the Organization. It contains twelve stele, arranged by the rank of each member from left to right then top to bottom, with digital panels in the floor before the stele acting as epitaphs depicting the member's title and weapon. 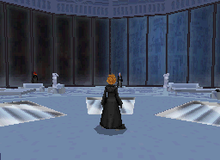 These stele actually operate as portals to other rooms in the castle, while the doorway to the next room takes the place of a stele for Xemnas. The stele for the destroyed members of the Organization have been smashed, but the epitaphs remain active for those that are conscious—therefore the epitaph representing Roxas, who has already been reunited with Sora, remains active, although his stele is smashed, while the stele for Luxord and Saïx remain active portals even after their epitaphs go dark with their destruction. Zexion's own epitaph was damaged to the point it no longer depicted his weapon, while Roxas's depicts the Oathkeeper and Oblivion he obtained after leaving the Organization. Sora and his friends pass through the graveyard on their way up the tower, but are forced to put an end to Luxord and Saïx in order to open the way to Xemnas. Havoc's Divide (混沌の狭間, Konton no Hazama?) is an area favored by Luxord. The area is sloped and leads to a steep drop downwards. The top of the area can be partially seen from Naught's Approach. Addled Impasse (惑わしの空間, Madowashi no Kūkan?, lit. "Bewildered Space") is a large chamber with a clear view of the Kingdom Hearts moon, and appears to be where Saïx spends a large amount of time. Naught's Approach (虚空を目指す道, Kokū o Mezasu Michi?) is an exterior passage which leads to Xemnas's tower. Eerie red and blue vapors leak from Ruin and Creation's Passage and out onto the walkway. Ruin and Creation's Passage (破壊と創造の回廊, Hakai to Sōzō no Kairō?) is the biggest area in the castle with platforms floating in the air. Invisible paths can be used to reach each platform and eventually navigate to the other side. The room is filled with swirling red and blue smoke, with some collecting in a spiral at the top of the chamber. There are numerous windows at the sides of the room. The Altar of Naught (虚空の祭壇, Kokū no Saidan?, lit. "Altar of Empty Space") is a giant tower that is high above the rest of the castle. Hidden off the side is a glider. Xemnas often comes here to commune with Kingdom Hearts or present it to the other members. After Sora and his friends confront Xemnas here and he retreats into this Kingdom Hearts, the worlds create a doorway leading within so that Sora and his friends to follow him. The tower later collapses after Xemnas's Dragon Form collides into its side. Memory's Contortion (記憶の歪み, Kioku no Yugami?) is a strange, wavering illusion of the Memory's Skyscraper that Xemnas draws Sora into for a battle. As it is an illusion, Sora cannot "return" here, but a simulation of it can be found within the Garden of Assemblage. Where Nothing Gathers (虚無が集う場所, Kyomu ga Tsudou Basho? ), known to Organization members as the Round Room (円卓, Entaku?, lit. "Round Table") or Where Nothing Gathers (虚無が集う場所, Kyomu ga Tsudou Basho? 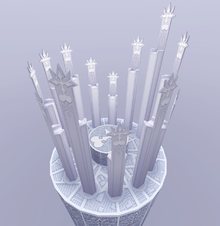 ), is a circular room containing throne-like chairs ranging in height, where the Nobodies of Organization XIII can gather and discuss developments and for Xemnas to give out orders. There are thirteen throne-like pillars which each member uses as a seat, but these pillars can move up or down at the user's will, or at the leader's. Out of respect for their leader, the other members keep their thrones below Xemnas's, and later, Xehanort's. The seats are arranged in a circle with Xemnas at the prominent seat. At Xemnas's left are the odd numbered members, and to his right are the even numbered members, increasing in numerical value up until number thirteen, Roxas's seat. The "fourteenth member", Xion, has no throne as she was neither a true member nor even a real Nobody, but a replica, meant to fuse with Roxas, thus the reason for the group's name remaining as "Organization XIII". In Kingdom Hearts 3D: Dream Drop Distance, Riku and Mickey Mouse battle Ansem, Xemnas, Young Xehanort, and the other members of the real Organization XIII in Where Nothing Gathers, while attempting to rescue Sora, who was rendered comatose and captured by Master Xehanort to become a new vessel for himself, who sits in Xemnas's throne while watching the struggle. After the battle, Master Xehanort lifts the throne Sora is in and tries to put a fragment of his heart on him. Fortunately, Lea appears and rescues Sora. Shortly afterwards, Donald and Goofy also appear and literally fall on top of Ansem's Guardian, which had captured Riku and Mickey, just before the real Organization XIII vanishes and each of his members returns to its own time. Roxas in the Grey Area. The Grey Area (闇と光を紡ぐ庭, Yami to Hikari o Tsumugu Niwa?, lit. "The Garden that Interweaves Darkness and Light") is a room in the castle that serves as a lounge for the Organization's members, as well as the place where the members receive their mission briefings from Saïx. The room is wedge shaped with one wall made entirely out of a giant window, out of which Kingdom Hearts can eventually be seen floating in the distance. The room has couches and tables spread around it, and Organization members are often seen lounging about between missions. There is also a Moogle here, dressed in the Organization coat, that allows Roxas to synthesize panels and access a shop that uses heart points as currency. Xion in the Computer Room. The castle has a room with a computer that seems to contain information on all the Organization projects including the Replica Program and Castle Oblivion. In the Kingdom Hearts 358/2 Days novel, this room is said to be Saïx's study room. The Castle also contains a library filled with literature on various subjects. In here, Axel finds a book titled "The Truth about Naminé," authored by Vexen. In the Kingdom Hearts 358/2 Days novel, this room is said to be in Castle Oblivion, and was Vexen's research room. Each of the members of the Organization has an individual bedroom in the castle. The rooms are white with metal-like walls, a single bed with the headboard in the shape of the Nobodies' symbol and a window showing the heart-shaped moon of Kingdom Hearts. The Delusive Beginning (幻想のはじまり, Gensō no Hajimari?) is the lowest known area of the Castle That Never Was, situated just inside the large spinning ring at the base of the castle. It is comprised of four hallways connecting to a circular central chamber, two connecting at the ground floor, two high above. In the central chamber rests an energy beam housed in an impenetrable shield that damages enemies of the Organization. It must be destroyed by entering the shield through a portal and using a Reality Shift on it. This will cease its attack, destroy the shield, and create a walkway to the upper levels. The Walk of Delusions (幻惑の歩廊, Genwaku no Horō?) initially appears as a shifting maze. Scattered throughout the maze are devices that require the use of a Reality Shift to destroy. Once disabled, the layout of the area changes, with new pathways opening up leading to the next device. Once three devices have been destroyed, the maze disappears entirely and reveals the area to be a long, straight bridge leading from the outer edge of the castle to the castle itself, across the open area beneath it. The large spinning ring and several support beams can be seen from the walk. Fact within Fiction (虚実を紡ぐ回廊, Kyojitsu o Tsumugu Kairō?) is a large, open-air level at the top of the castle's spinning ring, giving a view of the mechanism that spins it. It consists of several high-walled passages and thick metal pipes. Along one passage, beams of purple energy move back and forth that damage anyone who crosses them. Near the end of the area is a large circular platform where many enemies spawn. After a flight of stairs, there is a lift that rises seemingly magically to higher floors. The Verge of Chaos (混沌を見下ろす場所, Konton o Miorosu Basho?) is primarily a large, slightly curved balcony. The only way out of it is to take the elevator back to the lower levels, or to use Flowmotion on the massive pipes attached to the walls. Several other, smaller balconies sit on the wall with no way on or off but through Flowmotion. Eventually, up the wall, one reaches another small balcony attached to a larger one by a staircase. A narrow bridge off this area connects to the multi-turreted tower, where Riku fights the Anti Black Coat Nightmare, on the side of the castle, that can be traversed by using Flowmotion on a large pipe. The roof of this tower is also considered a part of the Verge of Chaos. The arena Young Xehanort transports Riku to in order to battle him. The Sanctum of Time (時の祭壇, Toki no Saidan?) is an area visited only during the final battle with Young Xehanort. After being possessed by his future Master Xehanort self, Young Xehanort transports Riku and himself to the Sanctum of Time in a similar fashion to how Ansem, Seeker of Darkness transported Riku to the facsimile of Kingdom Hearts in the final battle of Kingdom Hearts Chain of Memories and Kingdom Hearts: Re:Chain of Memories. The battlefield is a large circular area with several cogs and clockwork devices integrated below the floor as well as atop pillars on either side of the battlefield, and it is surrounded by six different colored hourglasses. The area as a whole resembles a fractured ring dial. Peculiarly, at certain times during battle, the poles sticking out of the ground cannot have Flowmotion used on them. Beneath the glass is a red Nobody symbol. Kairi, Riku, Donald, and Goofy walk up to Sora after defeating Luxord. Sora and company encounter Saïx. Master Xehanort sitting in Xemnas's throne. The headrest of the thrones in Where Nothing Gathers. In Proof of Existence, the number XI is in front of Demyx's tombstone, even though his rank is number IX and Marluxia's is XI. This mistake was left uncorrected even in Kingdom Hearts II Final Mix and Kingdom Hearts HD II.5 ReMIX. ↑ At the time Kingdom Hearts II was released, Zexion's weapon had not appeared within the games, so Nomura and his team felt that it would be a spoiler to depict it via the panel. Therefore, they obscured it with the intention to reveal Zexion's planned weapon (a Lexicon) in a later game, which ended up being Kingdom Hearts II Final Mix. ↑ Roxas's Diary, Day 7: Entry 1: "Today they told us to go to the Round Room, where we met our new member, No. XIV."